Intelligence has become a taboo subject in some educational circles. Rather than than avoiding the subject, hit the issue head-on by addressing some of the myths associated with the concept of intelligence particularly in the classroom setting. 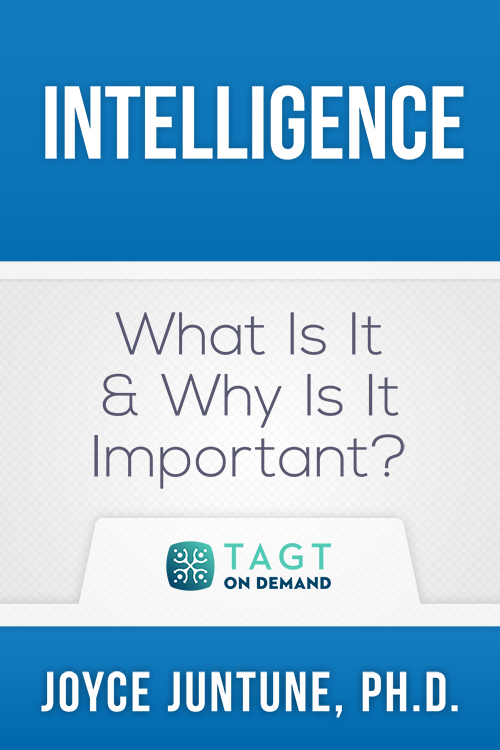 In this 1-hour course “What is Intelligence and Why Does it Matter?” you’ll hear from Dr. Joyce Juntune, a leading expert in the field of education, why it is essential for the success of all students that we begin talking about intelligence in education. Dr. Juntune is a renowned consultant, trainer, professor, and lecturer with more than 45 years of experience in the field of education. She is an instructional associate professor at Texas A&M University, and she teaches graduate-level courses in her expert areas of intelligence, child and adolescent development, educational psychology, giftedness, and creativity. She has focused the majority of her career on the areas of intelligence and gifted and talented education. Dr. Juntune has served as the executive director for the National Association for Gifted Children and the Institute for Applied Creativity at Texas A&M University.